ADJUSTABLE COMFORT INSOLES - Just Pump-It-Up! 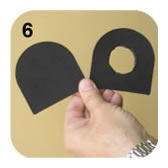 Inflatable Replaceable Inserts for Shoes, Foot Leveler. The nation's premier online store, AIR-PUMP-INSOLES, Inc., offers a brand new, premium, consumer product - INFLASOLE™, state of-the-art, patented technology, never before seen in the insole or orthotic industry. Podiatrist Recommended. If you suffer from plantar fasciitis, or heel spurs, you owe it to yourself to try therapeutic use of NFLASOLE™. Having INFLASOLE™ once inside your shoes you'll never again want to have any other insoles. Nothing else come up even close. We challenge any other insoles/orthotics. 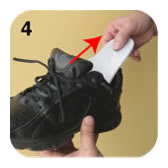 You can check it for yourself - just Insert only left or right INFLASOLE™ in one of your sneakers, and then make a few steps with whatever you have in your other sneaker - you will see difference instantly. 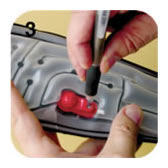 Beside inflatable bladder which provide supreme shock-absorbency, and can be adjusted according wearers weight, included are partial inserts to put underneath of the inflatable bladder for additional custom adjustment - for raising heel (full or laterally or medially), or for extra arch support. That is optional - depending of the your shoes or if needed. Also, every patient who has knee and/or hip replacement needs INFLASOLE™ - because after surgery, patients needs to walk following day or two - wound is fresh and every patient has different weight. They need supreme shock-absorbency. If you are not sure how to insert INFLASOLE™ properly or if you have a foot problem that needs special treatment, consult with knowledgeable honest podiatrist near you. We Offer a 100% Satisfaction Guaranty. "TREAT YOUR FEET, THEY ARE CARRYING YOU." 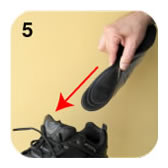 © 2011 Air-Pump-Insoles, Inc. All Rights Reserved.